The Minnesota Forecaster: Mayday! Mayday! Could There Be Accumulating Snow in May? Mayday! Mayday! Could There Be Accumulating Snow in May? Mayday (per Merriam-Webster): an international radio-telehone signal word used as a distress call. We propose a new meaning: a cry from distressed locals who can't believe what some weather models are suggesting. That'd be S - N - O - W.
If you do the math, it appears the NWS calling for perhaps 3-5 inches of snow. KSTP's Dave Dahl forecasts "mainly a cold rain." KSTP has been better than most weather outlets recently. MPR: "At this point, two to as much as six inches." What do you say peeps? Could this really happen??? The scene on April 30, 1984, Mr. TMF's first spring in Minnesota. @Bill,where's our Novak video? Or are you both as amazed as I am that were still talking snow and not only will it snow I'm hearing inches of snow....Paul Douglas is going with 2-6" and is using the word "plowable",even shows one weather model with Rochester get 15"....insane!!!!!!! big daddy, I am absolutely stunned at the possibilities that that models like the ECMWF,GGEM,UKMET,4km Nam, and the JMA are showing, way to early for totals, but my worst fears seem to be a possibility as the precip that the inverted trough brings to MN cannot move south or very far east because of the strong blocking to the east. And I heard tonight that MDOT has removed all the plows from their trucks. SNOW ACCUMULATIONS OF 2 TO 4 INCHES ARE LIKELY WEST OF A LINE FROM CHARLES CITY TO WINONA TO MEDFORD. THERE IS THE POTENTIAL FOR A SWATH OF 5 TO 8 INCHES OF SNOW NEAR THE INTERSTATE 35 CORRIDOR...POSSIBLY EDGING INTO WABASHA...OLMSTED...DODGE...MOWER AND MITCHELL COUNTIES. MOST OF THE ACCUMULATION WOULD BE ON GRASSY SURFACES WITH MAINLY A SLUSHY ACCUMULATION ON AREA ROADS. That's the LaCrosse WX office discussion. C'mon Big Daddy what other NY Post style headlines can you think of for this? @MN WeatherFan.......that's so funny and true, my brother had to read a copy of the NY Post everyday. This time of year, take whatever the models print out and pretty much throw them out the window. They are not factoring in the warmer ground or the stronger sun angle during the day. I honestly think that even 5-8 will be tough to come by even for a long duration event. I guess there could be some isolated areas that see that but I really am not expecting areas to see those ridiculous totals the models are currently showing. That being said, this could end up being a record breaker for the month of May since that total is so low. I think the bigger concern here is that another 2-3 inches of liquid could end up falling into what's already swollen creeks, rivers, and streams. The areas that see the best snows will be a fairly narrow area but I think it's still just a bit too early to try to pin down any totals. Not true at all re:models. Accuweather just posted a story titled "Major Snowstorm from Omaha,Neb. To Minneapolis"......putting Minneapolis in the 3-6" range with localized 10" amounts within that band! NWS states for my location(Golden Valley) Rain changing to snow by 10am tommorrow,may possibly mix with rain still and temps falling to 34....2-4" by tommorrow night! !.......reading their aviation forecast sounds like to me when the most intense precip is falling tommorrow it will be in the form of snow.......I still believe no one has a full grasp on what will happen and are DISMAYED that some models are projecting some over the top totals! @big daddy Good stuff! Thanks for relaying all the good info. Btw, hoping to do a video with Dr. Novak tonight shortly after 9. Lets clarify that title on accuweather to Major Snowstorm Potential From Omaha to Minneapolis. If you read the post, there were a lot of "if's" in it as well, specifically stating that if the right pieces came together, which is not certain at this point. You seem to like to hype the weather as much as some of the people on tv. Dave Dahl has the metro in an entirely cold rain event (no accumulation). Of course thats 10 inches of snow falling...with maybe an inch or two accumulating. Winter Storm Warning in effect for the Metro for 6-9 inches. Amazing...simply amazing! I agree with the "surprisingly quiet on here" comment above. This is an historic event......or could be. I want it all to stop and would love spring/summer to stay (last weekend was AWESOME!! ), but we can't control that so we may as well break a record and go for it. So, let's get the conversation going. And, I say.....Bring It! Areas of southwestern Minnesota (Slayton area) are already picking up greater amounts of snow than forecast. I think I literally JUST watched the rain drops convert to snowflakes here (26 floors up) in dtown Mpls! Winter Storm Achilles is absolutely RAGING outside right now. The flakes are almost even hitting the ground! Visibilities are down to 5 miles. Winds are blowing...somewhere, way up there I bet. Whew...I'm always going to remember the wrath of Achilles and tell my grandkids about it. That would have been a lot more interesting a picture if you'd captured the snow. Meanwhile, I'm enjoying myself in sunny Wisconsin Dells. Sunny and 70. It's awesome. Converted to a sloppy rain/snow mix in Eagan at 2:45. Huge flakes mixing in with the rain. Outdoor temp readings from car/workplace indicate 36/37 respectively. Waconia changeover happened before 8:00 and it snowed until about 12:30 with grassy snow accumulations. Then, it stopped and the snow all melted within an hour. Sounds like the real event is overnight tonight. I wonder if MNDoT is scrambling to put plows back on trucks...or will roads stay just wet? I know people won't care that it is a bust, but it is for at least the metro/loop.Enjoy the snow south of MSP because that's where the heavy snow is lining up again,not hard looking at the observations and radar trends. Also NWS trimmed headlines to the north(advisory area). ASSOCIATED WITH DRY AIR...PREVIOUS FORECAST LOOKS PRETTY GOOD. As far as I'm concerned, it can keep pushing east. We saw enough this morning and I'm ready to play ball! Is it taking too long to change over? Upper 30's at 6:00 pm in the metro. Nothing "rare" and "historic" about that! Just a bunch of model/met hype! Dave Dahl you were right yesterday, too bad you changed your tune and felt you needed to follow the NWS with your morning forecast. Still seems to be a pretty big difference among forecasts out there. Novak said 1-3 for Mpls. Kare has been similar since yesterday. But NWS has up to 10 inches through tomorrow (!). To the uneducated eye (OK, mine) it sure looks like everything is just missing the core MSP. Besides the snow forecast, it seems like less overall precip will be falling than originally predicted? Radar shows a solid area of green echoes over the southeast metro, but nothing is falling outside of my house in the Inver Grove area. Weird. What's going on with this storm, Novak, Randyinchamplin? Why is Hennepin Cty in a WSW? Ridiculous. Just one more misplaced headline to add to all the others this winter/spring! Nothing to see here, ho-hum. Someone earlier asked what's going on with this storm,well the easy answer is its missing us, just look at the radar returns to much dry air is pushing the precip south of MSP keeping us high and dry with NO RECORD snowfall, sorry to those who wanted to see that, bo-hoo! I'm starting to really think this is a B-B-B-U-S-T! Bring back the sun and 75 degrees! NWS did a pretty good job explaining in the forecast discussion the complexity of this forecast. However, they should use their own rationale and bring down the totals. I'm not throwing in the towel yet, however it is not looking good for snow in the immediate metro (yet). Agree. I know that we're outsiders looking in, but it seems pretty obvious that we're not going to get the snow totals they forecast. BUST indeed, amazing that people have full time jobs predicting the weather, dedicating hours to their profession and they can be this wrong. A winter storm warning was issued less then 24 hours ago and we won't even see a inch of snow, that is down right pathetic, I would be fired from my job if I grossly failed liked that. Maybe a bust for the Twin Cities but down here in Red Wing I don't see us getting out of 6+ inches, just like forecasted. They knew there was going to be a sharp line on the north side of the storm, they got it wrong by a few miles. hard to see coming. While the rest of you anonymous complain and whine about more busts, know that it's not a bust for everyone! Not a drop of rain let alone snow in the past few hours here in Minnetonka. Side walks and roads are actually drying up at 9:30pm. It looks like everything is sliding to the east and that if we get anything it will be between 1:00am and 4:00am for any kind of accumulation. My guess is 1/2 to 1 inch of slop on the hard. Time for some "now casting" and about 2/3's of the MN counties currently in warnings, should be dropped. BUST, but I'm not as critical as if this were a bust in the the winter months. One reason I may not be as critical is I've made some mistakes at work myself and haven't been fired (yet). We can all only hope to improve. I don't even think Hennepin Cty deserves an advisory, let alone a warning. What's the deal? There will likely be a 6"+ gradient in the snow totals within a 30 mile drive. So, if you live in Farmington, Hastings, you will get 6" yet those who live in Maple Grove, Anoka may not even receive a coating. This was well advertised by most weather outlets, however some were simply just a little off on where the heavy snow axis would set-up. It appears to me that the NWS was about 30 miles to far to the NW with this axis and that will make a world of a difference especially in the MSP metro. MWS dropped Hennepin. Odd to see Ramsey in a warning and Hennepin with nothing. When you sit back and think that we were under a winter storm warning and had nothing more than an hour or two of flakes that amounted to nothing..... seems weird. Given the lack of confidence that the NWS felt all along, it makes you wonder if a WSW was really ever justified. Always thought a WSW came with a high degree of certainty about an event. No? Also, even in the few isolated areas that might end up with 6 inches, is a WSW still really warranted given that it will melt so quickly and won't have nearly the same paralyzing effect it might otherwise have if it were mid-winter? It's almost like southern standards are applied to our warnings once we hit April. My now cast and why what has happened. Observed sounding from MPX at 7pm shows heavy snows above 2km, but a dry layer below that. The observed sounding from KABR shows a very deep dry layer from the surface up to 5km. The Wood Lake wind profiler shows winds from the surface to 4km out of the north and than turning to the southwest above that layer. Returns from the radar program at MPX show snow at the highest tilts including composite reflectivity, but of course dry at the lower tilts. The wind profiler off the GR Level III program from MPX shows wind out of the north up to 10ft, before they turn to the southwest. Given the fact that the observed sounding is showing a dry layer below 2km and the winds are out of the north over the wood lake area and MPX, I really don't expect that dry layer to be overcome throughout the nite unless a strong low level jet out of the southwest sets in. Furthermore, looking at the wind profile from ARX, they are out of the northeast from the surface to 4k ft then out of the southeast above that. I looks like warm air is over running cold air strongly suggesting that the best forcing is between there and MPX which of course is well depicted by the radar returns. NAM Bufkit forecast soundings have come in and it shows the dry layer holding true until 3am where a couple of inches of snow could fall but may not have any accumulations. Love it Randy. Your digging is right on the money. All of this leads to an extremely sharp gradient in snow totals. Unfortunately, this will occur right over a good chunk of the metro. Hopefully the public understood that this would be the case overnight. Hmmmmm, but a Winter Storm Warning was issued, and even the updated NWS commentary at 9:47 p.m. was still calling for accumulating snow. Unless something drastic occurs overnight, this is a BUST! You can't issue a WSW and then have no accumulating snow and not call it a bust. Agreed. A WSW implies a degree of certainty. TWC app on my Ipad has pushed out 2 alerts - Winter Storm Warning and Local Pollen Alert. That pretty much sums up our whole season right there. Interestingly, it also says we have had 1.2 inches of snow in Stillwater. I'm ok with that, since they are clearly referring to invisible snow! Minnetonka.3:55 am....not a flake of snow or a drip of rain on the ground (hard or grass) anywhere to be seen. Roads and side walks dry. Nothing after 6:00pm last night.A giant thud of nothingness. Snow, furiously none existent as is the roar from our un- started and idle snow removal equipment. Yes, the "mark" was missed again. Yes, it is snowing somewhere on the planet, even a bit south east of here but the TV heads couldn't even get it right 4- 5 hours in advance. NWS>>>Winter Storm Warnings? In MPLS ? Then pulled? And 2-4 still predicted starting after midnight. Now going close to 4:am... nothing. Not for MSP, but an absolutely historic snow storm for Rochester and Red Wing. Incredible. 1.5" on the grass in Inver Grove Heiights (northern Dakota county). True but we (Mpls.) should have been in a WATCH, as in "beware" not as a WARNING , which is imminent. Because it was NOT imminent. It did not happen. Not even a flake, not even a rain drop in sectors that were in an imminent STORM WARNING. It should have been a watch. Imagine the 10's of thousands of dollars in equipment and man-hours for every independent contractor as well as every individual city/ county/ that was in the storm WARNING setting up equipment and now removing equipment. YES, there was snow, and a lot of it, just not in this sector AND the fact that not even an ounce of precip.hit the ground after 6pm. and still predicting 2-4.... 2 hours before it was going to happen...which it did not. I guess I'm just sore at the man hours put in and the cash paid out and the loss of money due to these kind of expenses AND TAX DOLLARS that these misses between watches and warning can cause. It is not a game with our type of business, it is a financial reality. And injurious to our survival. I'm glad we did not get hit because big, wet ones like this destroys our equipment and because of the amount of extra work we sometime don't break even. Cheers, MNPLOWCO....spring please. I agree that with so much uncertainty with the forecast a winter storm watch would have been better suited for the Twin Cities core metro. I am being concise because the official 13 county Twin Cities metro area now includes the WI counties of Pierce and St. Croix. A winter storm warning brings a strong degree of certainty, or at least it used to. That is why there is a distinction between a winter storm watch (caution, monitor the situation closely) and a winter storm warning (prepare because it's coming! ), just as there is a distinction between a yellow light (caution) and a red light (stop!). It never seemed to be in doubt that areas such as Red Wing and points south and east would get hit hard. However, by listening to the NWS forecasts throughout the day and evening yesterday it appeared that they were always very confident of at least a few inches of snow falling over most of the metro, particularly from downtown Minneapolis/St. Paul and points south and east. I understand that weather forecasting isn't easy and that it's part science and part art. I get that. However, this goes down in the books as a big miss for all but the extreme southern and eastern fringes of the metro...plain and simple. Hey MNPLOWCO...We can all appreciate that weather forecasting is not a perfect science. If it was, this board would not exist. I appreciate that you have a business to run. Respectfully, if your business is dependent on accurate weather forecasts then you should spend the money to hire a weather professional of your choice. If you can find one that's better, more accurate and more profitable for your business than NWS or media sources... than spend the cash. To kvetch about "tax dollars" rings hollow when you are essentially using a free weather service for your business (NWS) who's mission is "the protection of life and property." Most media sources did not forecast a "plowable" snow for the west metro. The fact is, weather forecasts are accurate and useful as much as 90% of the time within 24 hours of an event, and this saves U.S. businesses as much as 4 - billion dollars annually. If you have a better source for weather, then pony up and pay for a weather service that you believe will make your business more profitable. The trolls on here are pretty annoying, guess they got that going for them. @Anonymous, It is simple, it was a miss in the metro. Period. That is all I am saying. As to paying for a Met., I always appreciated everyone on this site. Most of the talk here is way over my head (as is the snow). I only have 45 years in the business, as an successful owner, but what do I know. As for FREE, I have stated that this site needs a donation site and would gladly pay for the insight that this group brings. @P and others on this site, Sorry for venting off topic, it was "trollish" of me. We picked up around 2 inches of snow in Rosemount during the very early morning hours. However, the pictures out of Rochester are incredible! They are getting hammered with very heavy snow accumulations down there. I saw that Ellsworth, WI has already reported 14 inches, and it's still snowing! Amazing stuff! Schools as close to here as Cannon Falls are closed today. More than 7 inches of snow has been reported in Red Wing. I was rooting for the epic snowstorm to strike here in my little corner of the metro, but Mom Nature had other last minute plans. Now I have to play softball tonight in St. Paul in cold, raw conditions. Uugghh At least the Twins get paid to play in those conditions. I do it for the love of the game. I see that the current forecast for next Monday night's game is for clear skies and 70 degrees! It appears that the cold pattern should now end. No more sudden stratospheric warming. The polar vortex is entering its summer mode. 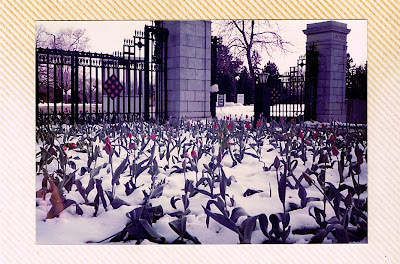 Let's bring back spring and hope that winter returns later this year with lots of snow for next season. I do need a good therapist . "The Storm Prediction Center (SPC) in Norman, Oklahoma is tasked with identifying areas favorable for severe weather. If SPC forecasters think conditions are favorable for severe weather in the coming hours, they'll issue a Severe Thunderstorm Watch or Tornado Watch. Once severe weather is occurring or imminent, it's up to the local National Weather Service to issue a "Severe Thunderstorm Warning" or "Tornado Warning" for a specific storm." Wow, the forecast for southeast Minnesota and western Wisconsin is for heavy snow through this afternoon with additional accumulations of 6+ inches! A lot of towns have already picked up 10-15 inches! It looks like those "wild" snow figures the models were putting out a day or two ago were right on the money. Amazing looking outside right now in Rochester. Just plain amazing. DysonGuy, send us folks here in the TC some pics! I live in Red Wing. While you in the cities think this was a bust, this storm was underforecasted. This is not only historic for being in May, this storm would be historic ANY month of the year! Official reports say 10', but our radio station KWING confirms our storm total in the southeastern side of town is 17 inches. This is the least of it. Power has been out sense 2AM, and hundreds in our city are without it until tomorrow at 6PM, restaruants that are open are packed with people, the tree damage is UNREAL, it looks like a tornado ripped through the city. At one point today almost everybody except the north side of town was without power and like I said hundreds are still without for another 24 hours. Earlier this morning if you were to stand outside all you would hear is the cracking of trees and branches falling. There were literally uprooted trees throughout the town. Historic storm for sure! 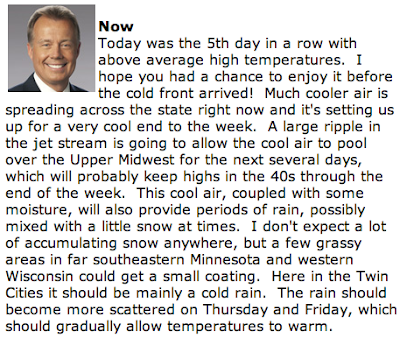 I guess this blog should be renamed MSP Forecaster. Minnesota weather in general seems far too broad of an interest for those here. The area of heavy snow, not surprisingly, did not perfectly align with forecasts. It rarely does. The precision required just isn't their with our (humanity) current understanding of how the atmosphere works and ability to model it. Verification would be a good topic for this site to explore and give the anonymous trolls some tangible information to digest. Yes, meteorologist can be wrong - that is inherent when you are trying to predict the future of a non-linear system. That doesn't mean that great, and I do mean great, effort does not go into minimizing the error and improving forecasts. That is the main thrust of modern meteorology since its inception 150 years ago. @P, I looked at your site suggestion and noaa states "Winter Storm- A snow accumulation of at least 6 inches in 12 hours, or at least 8 inches in 24 hours, in combination with one of the following: rain, freezing rain, sleet, wind, blowing snow or cold (wind chill). I guess my question was should this have been a watch in Henn. county or should it have still been a warning when nothing happened? Still moderate snow now in Golden Valley.........lawn and trees already coated......will MSP get in on the record breaking fun a day late?..........good slug of moisture moving due north along I-35. For the MSP core, the morning snow seems as much a force already than Wednesday's ever did. Not even a Short Term Forecast from the National Weather Service this morning on this DEFINITELY more than expected snow event today. Already 3" more in Owatonna today. Did the NWS go into hibernation for the winter? Drove around the southern part of Red Wing today. The tree damage is amazing. Branches down in most peoples yards and there are many larger (10+ diameter trees) that have split down the middle. By far the most damage I remember seeing from a snow storm. Well after that last snow, I felt the need to leave town for a few days to where snow was non existent. I will admit that was a pretty fun record to break and honestly I don't see that record being broken in any of our lifetimes. The models actually did a good job with the snow predictions and that is what shocked me the most. I really thought they were overdoing it because they weren't taking any melting into consideration. I really don't think any forecaster out there would have been comfortable with forecasting 12+ inches of snow on May 1st. Now that we have witnessed that it is possible, that could very easily change how they look at similar storms in future years. This one will be a good one for the archives. The strength of a May sun also showed up, given that the almost 10 inches of snow that we got is pretty much non existent only 3 days later. Looking ahead now, it doesn't appear any more snow is in the forecast. A wicked cold front blasts through Saturday morning that will cool things off for the weekend, before temps moderate again next week. Next week could be the return to better heat and even humidity for the central part of the country so we'll have to watch and see if the severe weather season gets underway as well. The long range is finally starting to look more spring and summer like. After 5 days the 14+ inches of snow we received is now a thing of the past except for a few snow piles here and there. From a freeze(early Sunday morning) to 90's(Tuesday).......only in Minnesota.....if you don't like the weather just wait 24 to 48 hours and usually there will be a change. So how warm/hot will Tuesday get?......NWS says its being conservative with their highs of mid/upper 80's at the moment. Bill, I think it's time for a new thread concerning the possibility of record high temps on Tues. You may want to start the thread with my comments from above.